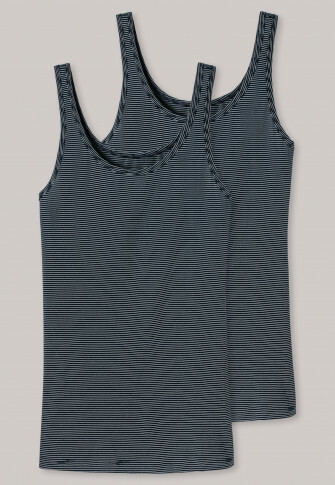 Basic underwear in a 2-pack: With these tank tops for ladies, a perfect fit meets wonderfully lightwieght material. 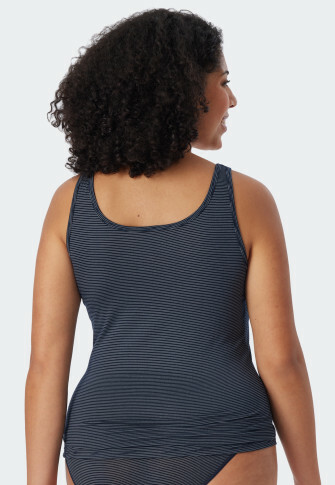 Shape-retaining, elastic single jersey with high modal content is the comfort secret behind both tops, which not only feel incredibly soft, they also regulate temperature. With their midnight blue and white, thin knitted stripes, these undershirts are a charming basic duo - in the best SCHIESSER quality, of course! Sehr schöne trageangenehme Qualität, sehr gute Passform und Qualität. Die Farbe und das zarte Ringelmuster sehen sehr schön aus. Angenehm schmeichelnd auf der Haut wie keine andere mir bekannte Ware. Höchste Qualitäten in passgenauer Verarbeitung. Ich mußte bisher noch nie etwas retournieren, aber die kosten- und problemlose Rücksendung soll easy und zuverlässig sein.